In case you haven’t heard, Clooney’s decided to cast off his Batman roots, and head for Rat Pack territory. For starters, he’s remaking the quintessential 60’s Rat Pack heist flick, Ocean’s Eleven. 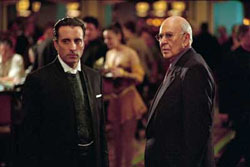 What is Ocean’s Eleven? Well, Clooney will tell you it’s not really much of a remake, having virtually nothing in common with the original Rat Pack film apart from its name. But even a film history dunderhead such as myself can smell the Sinatra droppings clinging to this baby. If you don’t know what the Rat Pack is, just think Frank Sinatra, Sammy Davis Jr., and Dean Martin making movies as an excuse to carouse around Vegas and get paid for it. Drunken debauchery has its advantages. Oh, and there’s this heist too. Rob a casino, get the cash. It’s actually quite a complicated little scheme. I’m not sure director Steven Soderbergh spends quite enough time exploring it, but technicalities aren’t what Eleven is going for. 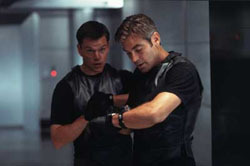 Clooney’s Ocean’s Eleven, while touted as a completely different film, seems to hold true to that spirit. It’s not a particularly heavy film. Nor is it particularly thrilling. The acting is grade A, but then it ought to be with a cast composed of every big name star (except Tom Cruise) Soderbergh could scrounge up. 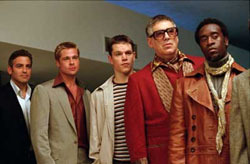 Yet, in spite of a fairly light plot and a mildly bland storyline, Ocean’s Eleven turns in a surprisingly entertaining little jaunt. I don’t recall ever feeling my heart pounding with excitement, but neither I, nor anyone around me spent a particularly large amount of time looking at their watch. It’s clear that this group had FUN with what they were doing. Ocean's Eleven is almost voyeuristic, like peeping in the window at the cool kids party you weren’t invited to or watching Robin Leetch prance about the lifestyles of the rich and famous. Sure, a robbery flick doesn’t have a lot to do with celebrity parties, but, just as it did in the old Rat Pack flicks, that spirit shines through. This film has style, grace, grace and charm. Perhaps its biggest crime was not knowing where to end. In particular, I’m talking about one of the final scenes which finds the whole crew minus Ocean (Clooney) gazing at the Vegas lights, then separating, amidst the blaze of fountains and flash, to go their own way. What a perfect ending. So perfect in fact, that when that moment ended, fully half the audience rose from their seats and headed towards the exists; only to be surprised with another 5 minutes of film we really could have done with out. 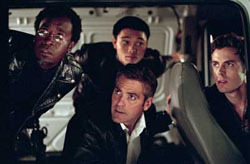 Pitt isn’t Martin, Clooney isn’t Sinatra, and Cheadle sure as hell isn’t Sammy Davis Jr. Rather, this group is actually capable of nearly passable acting and Soderbergh occasionally able to pull of some rather inspired directing. What the film lacks in passion it fills with roguish camaraderie and star-powered charm.